← The Sports Archives – Brief history of the 6 Nations! The Sports Archives – Top 6 Most Scenic White Water Rafting Locations! This popular river flows through the famous Grand Canyon. This multiple day trip takes you through over 225 miles of gorgeous water and stunning views of the North American desert. Lasting anywhere from a week to 17 days, you can travel in luxury while enjoying professionally prepared cuisine and numerous hikes when taking a break from the water. Arctic glaciers grace your vision on this breathtaking ride through North American terrain in the vast landscape of northern Alaska. In addition to water that is bleach white, you can spot bears, wild fish, and pick scrumptious wild berries during your trip. With a wide variety of time commitment, you can opt from a short trip of 1 or 2 days all the way to a one-week adventure in this diverse river. Going through many of the United States’ most scenic destinations, the Salmon river is perfect for amateur, intermediate and professional rafters alike. Arriving by plane, you begin this week-long journey in the wild area of east Quebec. Initially, rapid waters greet you from the Magpie, and the complexity grows with each section until you reach your final stretch that approaches the Magpie Falls. Not only can you set up camp for the night, you might be privileged enough to catch a view of the magnificent northern lights (aurora borealis). With so many world-class white water rafting locations in the U.S., you may be surprised to hear that the South American country of Ecuador boasts one of the most scenic rivers in the world. Surrounded by rain forest, you can watch as exotic animals fly, walk, and swim right by you. The local village of the Shuar will amaze you with Amazonian flora and fauna, and the narrow passage ways and vast canyons provide a challenging and exhilarating experience for any raft-goer. This unique rafting trip lasts just one day. The climbing walls of the nearby canyons are graciously flanked by large pine trees and dazzling, churning waters on all sides. With guided and private tours, this colorful landscape offers something for the entire family. After rafting, rent a bike or take a hike to get a bird’s-eye view of this amazing gem of the American Northeast. 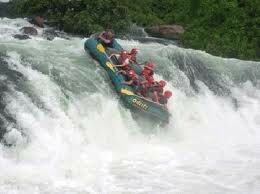 Whitewater rafting is the epitome of adventure: strapping on your gear, grabbing a paddle and bracing for the watery ride ahead is a thrill like no other. While there are countless areas worldwide to go rafting, these locations represent the best of the best when it comes to natural scenery. If you haven’t made a bucket list yet, perhaps one of these is a great place to start. This entry was posted in Other and tagged Alsek River, Canada, Colorado River, Ecuador, Gauley River, Grand Canyon, Magpie River, northern lights (aurora borealis), Rio Upan, Salmon River, scenic, sports and adventure, sports and leisure, sports and recreation, sports and travel, Sports Archives, Sports Blogs, West Virgina, white water rafting, white water rafting blogs, whitewater rafting, Whitewater rafting archives. Bookmark the permalink.